It’s pretty tricky to heat healthy, whole food during the holidays with all of those cakes, cookies and marshmallows laying around, but the truth is, there is a ton of nutrient-dense food available in the wintertime! 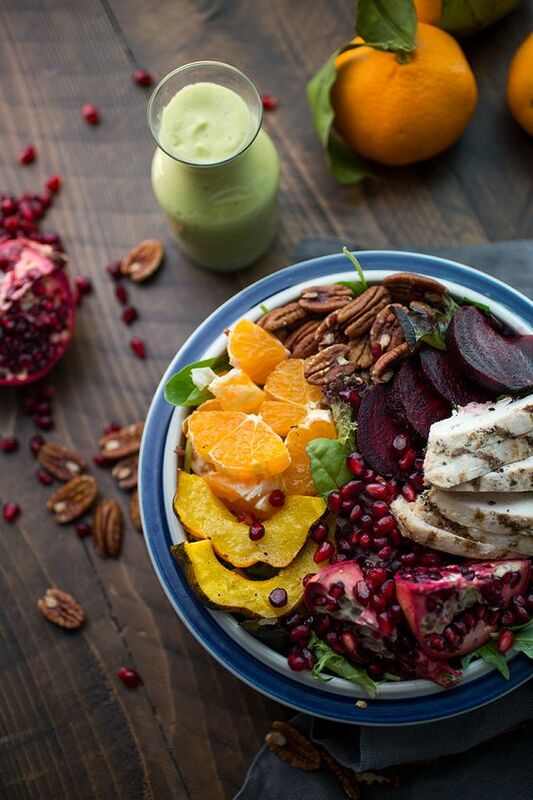 This Winter Harvest Salad with Avocado Citrus Dressing is both satisfying, yet light and healthy to give you a nice break from all those holiday desserts. The ingredients for this recipe will make 2 decent sized salads. If you’re cooking for more or less people, simply adjust the ingredients accordingly to provide the exact amount you need. Want to make this salad even easier to prepare? Simply purchase some pre-made grilled chicken breasts! Last but not least, you will likely have some leftover Avocado Citrus Dressing. Save it to use on another salad or even as a sauce for chicken or fish. Combine all dressing ingredients in a high powered blender until smooth. If the dressing is too thick, add a bit more water. Place dressing in fridge while you prepare the salad. Remove stem and slice acorn squash horizontally to create circular pieces. Discard seeds and slice each circle in half. Place squash on a parchment-lined baking sheet, cover with 1 tablespoon olive oil and bake for about 30 minutes or until soft and slightly browned. While the squash is baking, sauté the chicken. Slice chicken breasts in half longways or beat with a meat tenderizer to make each piece thinner. Heat a skillet on medium-high heat and add two tablespoons of oil. Once hot, add chicken and cook on each side until browned and chicken can be easily lifted off the pan. If it sticks, it's not ready! Remove chicken from pan and set aside to cool. 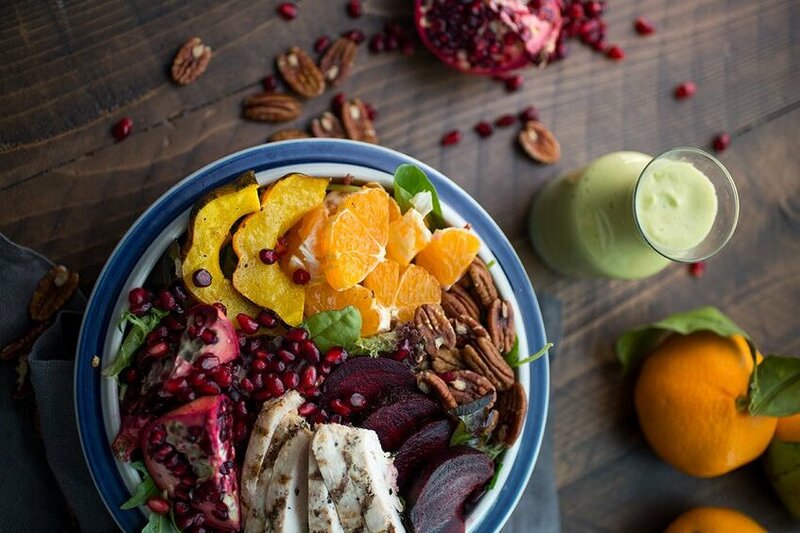 Start assembling the salad by adding lettuce, citrus, pecans, pomegranate seeds and beets to a large bowl. Slice the chicken horizontally on a diagonal and add to the top of the salad.